Basically everything that could’ve gone right did go right for the Dodgers tonight in a 4-0 win over the Cubs. Excellent pitching and timely hitting were the name of the game, and even without Justin Turner, the Dodgers are finding out a way to get wins against the tough section of their schedule. Alex Wood was largely sharp from the get-go with command and effectiveness of all his pitches, but the Cubs lineup is a slog to get through and they made him throw 91 pitches in just 5 innings. Thankfully those innings were all quality, as he shutout the Cubs and allowed only 2 hits and 2 walks while striking out 8. Better yet, both hits came on singles put on the ground, and at least one if not two of the walks should’ve been a strikeout instead. 1) How was the 2-2 pitch not a strike? 2) How was that not a swing? Wood’s ERA drops to 1.69, which would lead the league if he qualified. That discussion managed to get Joe Davis to mention Dodgers Digest and some idiot on broadcast. I then got owned online. Jake Arrieta didn’t seem like the pitcher who was getting shelled early in the season, and he generally looked pretty good. The Dodgers only got 5 hits and 3 walks on the night, but thankfully they made the ones they did get count. The offense got on the board in the 3rd thanks to a solo shot from Chase Utley. 1) Back-to-back games with a homer for Baseball Dad. 2) That guy’s food got destroyed. The next inning, the Dodgers got on the board immediately behind a walk from Corey Seager and a Yasmani Grandal double hammered into the left-center gap. 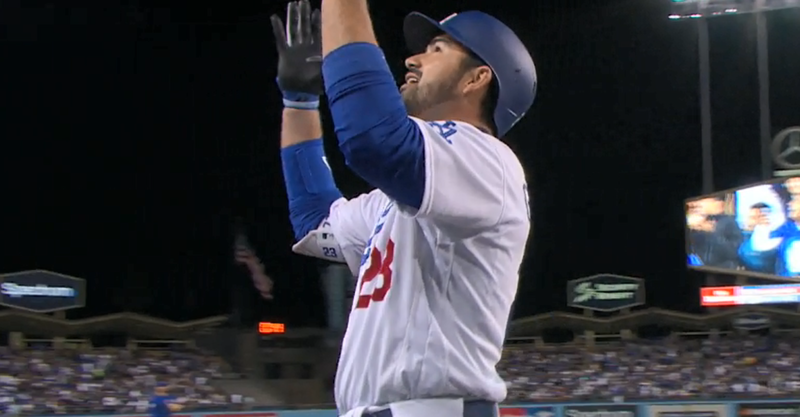 After taking an inning off from scoring, the Dodgers got back to it in the 6th behind a one-out single from Seager and then a two-out bomb to center from … Adrian Gonzalez? Yes, A-Gon with his first dong of the year, and it seemed like it might’ve honestly never come. Hopefully how he’s looked recently is a sign of health and a sign of improvement to come. Speaking of improvement, the pen was tasked to get 4 innings tonight, and they got 4 scoreless frames from just 2 pitchers. Pedro Baez got 2 frames for himself, surrendering just 1 walk while striking out 2. Tempting fate, Chris Hatcher was tasked with the 8th and got a 1-2-3 inning somehow, then he came back out for the 9th and got another 1-2-3 inning to end it. Like I said, everything was working today. The win moves the Dodgers to a good 29-20 overall and an excellent 19-8 at home. They will probably win 97 games and finish third in the NL West, however. Unfortunate. The Cubs will be back at Dodger Stadium tomorrow as the Dodgers go for a series win at 1:15 PM HST/4:15 PM PST/7:15 PM EST. The Dodgers will send Brandon McCarthy (3.76 ERA/3.15 FIP/3.37 DRA) to the mound with him looking to continue one heck of a bounce-back season so far. The Cubs will counter with famous mouth-breather John Lackey (4.82 ERA/5.01 FIP/5.27 DRA), who is having a poor season so far mainly due to home-run problems.